September 1953. Electric Time Switches. March 1960. Newbridge MkIII Gas Pistol. 1854 Gustav Horstmann started a retail and clock making business which thrived and became G. Horstmann and Sons. 1902 A clockwork gas controller was introduced for the automatic control of street lighting for the Bath Gas and Coke Co.
1904 Sidney Horstmann and his brothers established the Horstmann Gear Co to develop a variable speed gear-box he had invented for cars and motorcycles (it had an infinitely variable gear ratio). 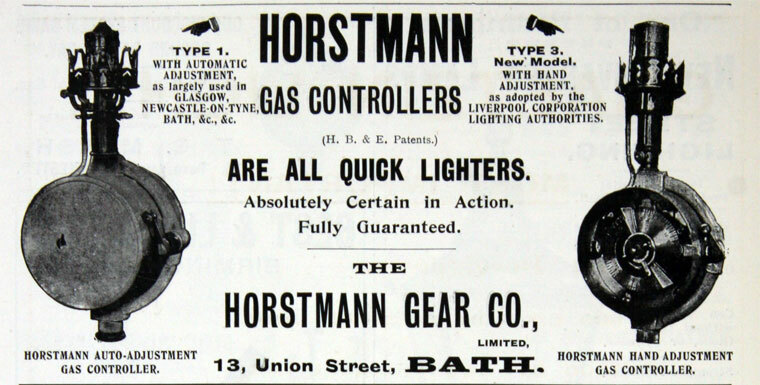 1904 Production of the gas controllers was transferred from G. Horstmann and Sons to The Horstmann Gear Co Ltd.
1904 The brothers patented the Solar Dial which automatically adjusted lighting times at dusk and dawn throughout the year. 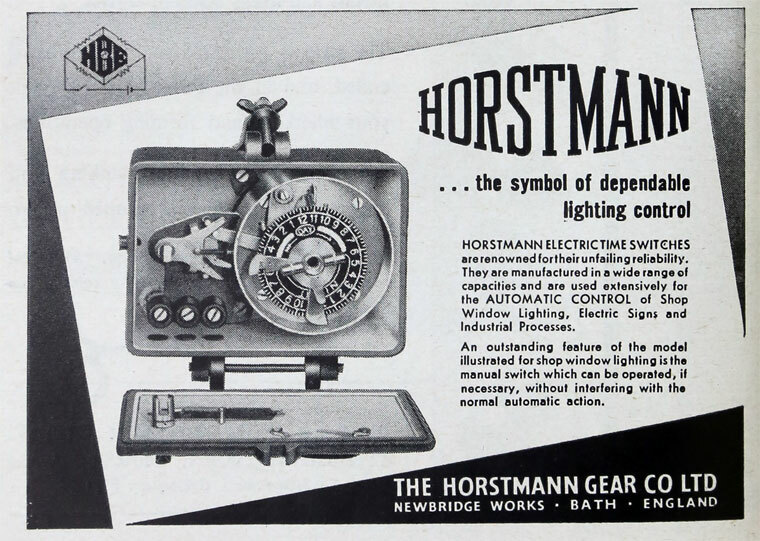 It was the start of nearly eighty years of Horstmann's manufacturing involvement in the street lighting controls market. The gearbox was not a success, but Sidney went on to make cars in his own business, also in Bath, producing about 1500 Horstman Cars between 1913 and 1929, incorporating many novel features in them. Altogether about 10 still exist. WWI The supply of German clock movements for gas controllers ceased; Horstmann's developed their own. They were then directed by the government to switch production to screw and limit gauges for manufacturing munitions, becoming a leading UK gauge manufacturer. 1915 The Newbridge Works was opened. The trade name Newbridge was then used on most of the company's products. Postwar: New products developed such as gardening tools, domestic clocks, mousetraps and cages for transporting and mailing queen bees. The main markets continued in street lighting controls, gas ignition, time switches and gauges. 1925 G. Horstmann and Sons’s retail business in Union Street closed after 41 years on the premises and 73 years as watchmakers, jewellers and retailers. Developed a gas controller which could be replaced in situ without disconnecting the gas supply, controllers for electric lighting, synchronous motor driven time switches, the Comet gas ignition device, the Gas Pistol for lighting gas ovens or cooking rings, the Distant Gas Switch equivalent to an electric light switch, and a patented thread gauge. 1939 the first system for timing central heating was introduced. WWII Made the Astro compass, mine switch-clock, radio transmitter for aircraft direction finding. Introduction of electric and gas-fired central heating controls; automatic ignition for cookers, and timers for 'off-peak' electricity. c.1955 Several products for vets were introduced by Horstman Ltd but this product range was sold off later. 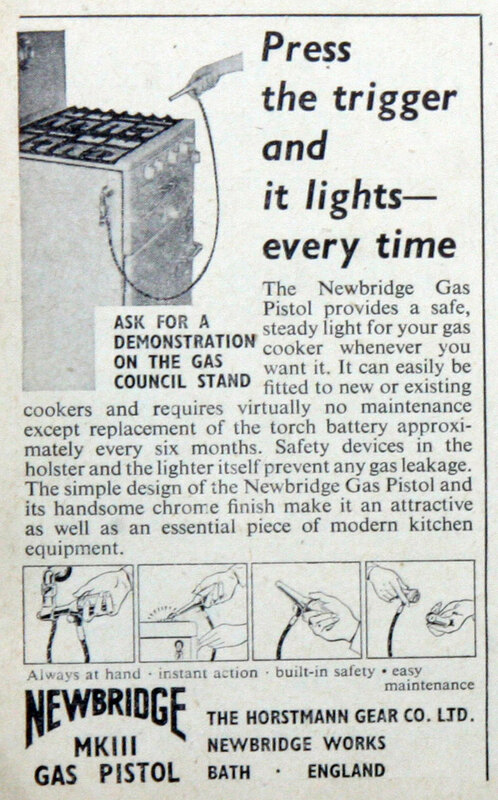 1970s Supplied gas igniters and cooker lighters for the replacement appliances when North Sea gas was introduced. Acquired Aish and Co Ltd. of Poole, specialists in marine equipment. 1978 Reorganisation of the company. 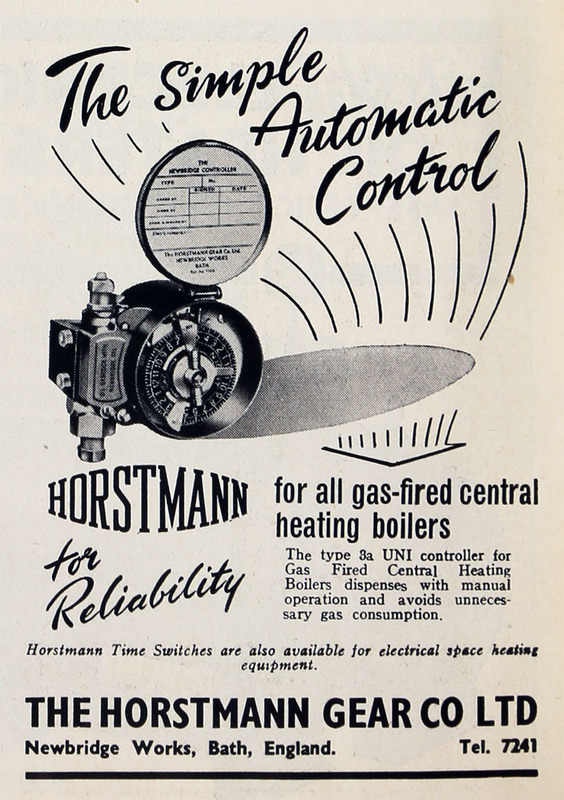 Established Horstmann Timers and Controls Ltd which replaced the Instrument Division; the Company changed its name to Horstmann Gear Group Ltd. Horstmann Engineering Products Ltd was created to develop new energy conservation products for commercial applications, which also took over the street lighting controls business. Acquired a controlling interest in Serck Controls Ltd.
1991 The street lighting controls business was sold to Royce Thompson. 1994 The family sold their remaining interest; Horstmann Group became part of Clayhithe plc. 1998 Clayhithe plc was acquired by the measurement and controls group Roxspur plc. 2001 Management Buy Out of Horstmann Controls. This page was last edited on 27 January 2019, at 18:41.